Thorkil Sonne’s commitment to expanding opportunities for people with autism began with his son, Lars. When Sonne and his wife learned that Lars had autism they worried that he would never have a normal working life. Autism Spectrum Disorder (ASD) is a complex and pervasive developmental disability that affects a person’s ability to communicate and interact with others. Limited ability to function in social settings coupled with particular personality characteristics, including trouble coping with stress, a need for clearly delineated tasks, and lack of flexibility, makes them difficult to employ. They fare poorly in high-pressure job interview settings, where social norms and ease in conversation may be weighed as heavily as skill sets. As a technical director in an IT company, Sonne became active in the Danish Autism Association. He then set up Specialisterne (The Specialists) to create a working environment geared towards people with ASD, enabling them to use their skills within the business sector. His initial vision was to create new possibilities for people with ASD. The goal now is to create one million jobs for people with autism and similar challenges. 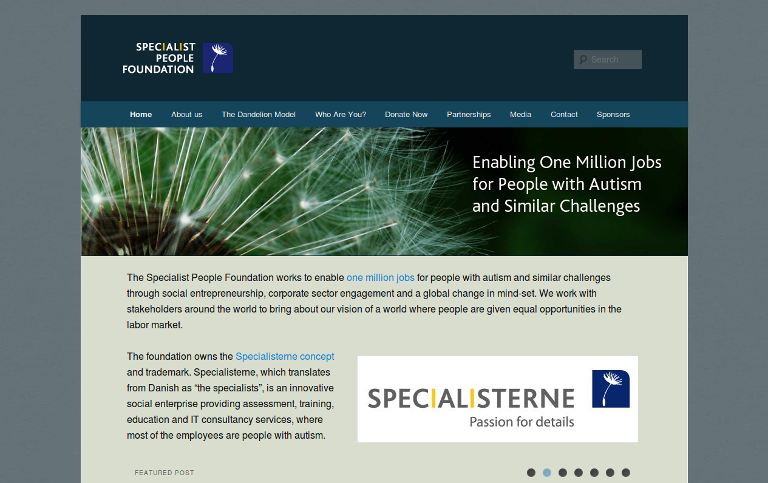 Specialist People Foundation (SPF) is providing a neglected population with the tools to be active, independent contributors through the Specialisterne company model, which capitalizes on the unique characteristics of people with ASD. Specialisterne is bridging the ASD community and business world. Specialisterne first evaluates potential employees through an assessment and training program funded by municipal authorities and/or grants.